Adds ability to search files by name and description. 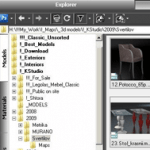 Adds ability to add description to 3ds max files. Displaying embedded to 3ds max files thumbnails. Include AutoCad file format as default on “Models” category. Displaying embedded to AutoCad files thumbnails. Adds ability to onoff extensions for display on “Models” category. (by default is it 3ds Max,VrayProxy, Mental Proxy, 3ds, obj). Adds ability to add files to favorities from status bar. Adds some methods and properties for PMStructureInfo*. Extremely speeding up opening directories with big number of subfolders. Fixes some issues with thumbnail rendering. Fixes a bug with correct displaying the Asset files. Related to "Project Manager v.1.54.20"